2016 Reissue on Colored Vinyl. Joseph Washington Jr.'s Merry Christmas To You is your shelter in a blizzard of bland holiday music. 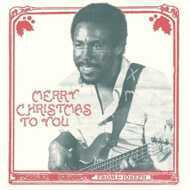 This barely-known 1983 private issue puts a soulful, funky, suave ribbon on nine frosty Christmas cuts—originals, not covers; real joy, real wonder—the greatest Christmas soul record ever recorded. Under this tree, discover new classics for our cynical age: the buoyant “Jesus’ Birthday,” the hot and bothered soul of “Merry Christmas,” the ridiculously catchy wallet-opener “Shopping.” Down another nog and file with Phil Spector's A Christmas Gift for You, John Fahey's The New Possibility, and Vince Guaraldi's indelible Charlie Brown Christmas.